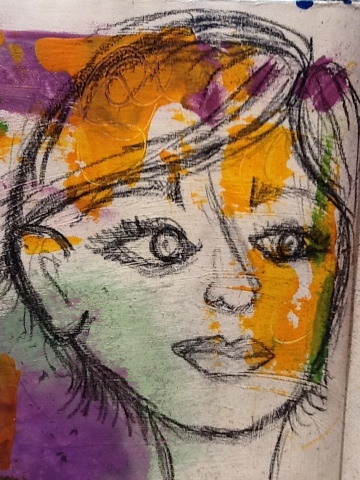 The pictures below portray my reason for learning to sketch faces: I want to use them on art journal pages. Who knows, perhaps I'll create other art with faces, but for now I simply want to practice them in my art journals. I created this particular page over months. 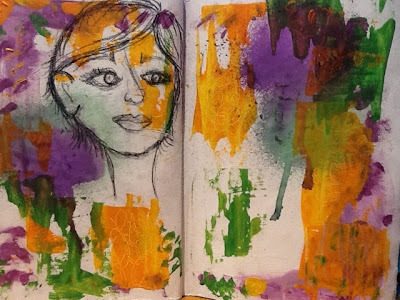 For awhile now, I've recycled leftover paint from other projects by using an old gift card to scrape it onto these previously gessoed art journal pages. I also used a broken mechanical pencil to etch lines into the wet paint. A few days ago I sprayed some spray inks onto the page and let them run. Then I sealed the pages with Workable Fixatif (by Krylon) so I could do other artwork over it. Today as I looked at the background I saw a space where a face belonged. So I just sketched what I was sensing, using a black Stabilo pencil. It was a fun, intuitive process. My girl isn't finished and neither is the art journal page, but I thought I'd share my progress so far.